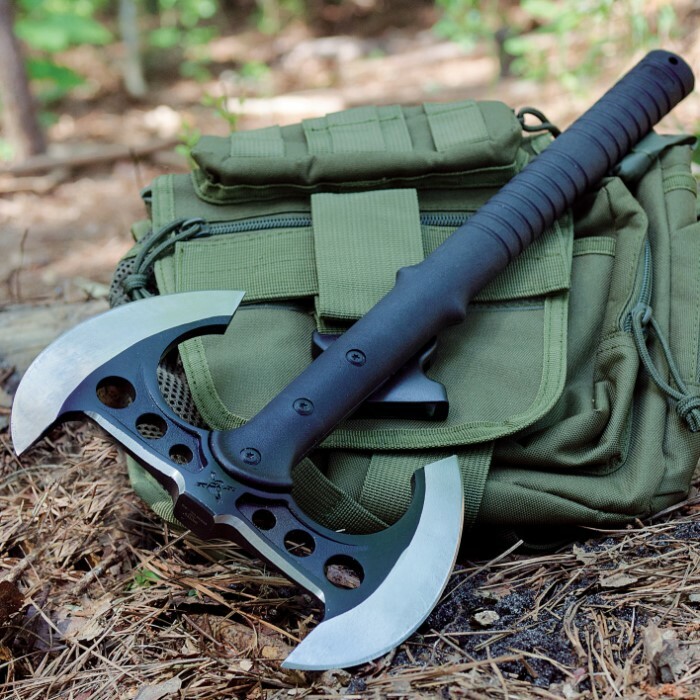 This advanced fighting tomahawk may be the ultimate tactical weapon. 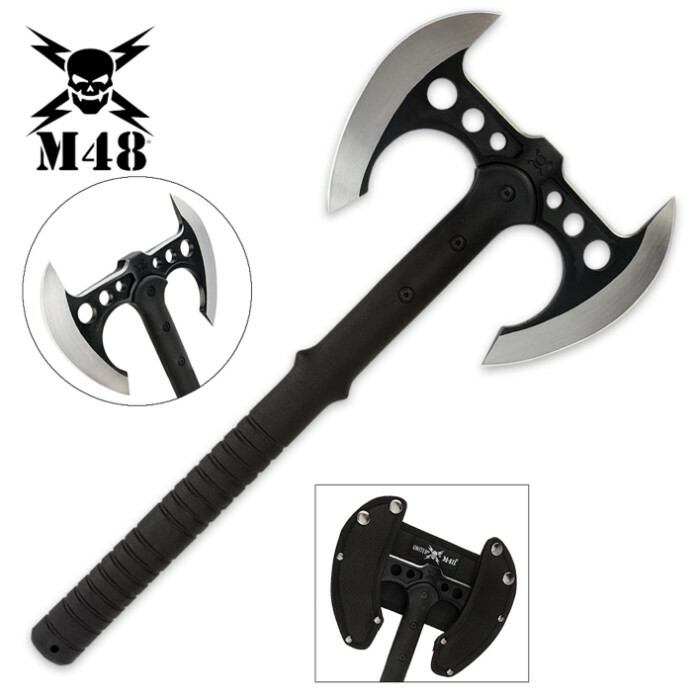 It is lightweight enough to be carried all day without added muscle fatigue and the tough head offers wide, upswept 5" axe blades on each side of the head for mammoth chopping, slashing and cutting potential. The anodized AUS-6 stainless steel head is securely attached to the virtually indestructible 30% Fiberglass reinforced nylon handle with three separate bolts. It comes complete with a nylon snap-button sheath. It is 16.78" overall. Well they certainly didn't lie about the dimensions of this axe, the head is small (no bigger than my hand). It looks like a child's toy in my adult hands but clearly it's not a toy due to its sharps edges. Due to its diminutive size it's ideal for clearing out zombies in tight quarters. The axe head itself seems to be solidly constructed, it's the handle I worry about when being thrown. If the axe head were twice as large and the handle of sturdier construction I'd have to give this axe five stars instead of four. Blades are sharp,with a little work they have a very nice working edge. The handle is not even close to indestrucable! Within 50 throws at a maple tree the handle broke off from the head. I was in love with it at first. It flew awesone and stuck in every time then broke. I had two of these tomahawks, and used pine log rounds as my targets. Initially i was in love with them. They seemed pretty sturdy, the heads were very sharp and stuck deep. Once I had about 500 throws in, the first tomahawk handle snapped off about a quarter inch below the third bolt. The tang was still intact, but two metal that ran along it and the nylon handle sheared right off. About a half hour later, the exact same thing happened to the second. I was initially impressed, but they did not hold together too long. I bought the tomahawk to go with my Scottish claymore (broadsword) and samori sword display on my Man Cave Wall. Fits right in beside the Henry Yellow Boy.